My son Ron recently purchased a slide scanner, a variation on the usual flat bed instrument that we use to scan paper images. I have borrowed the device and have been going through some of my old slides. I don't have many compared with a lot of folks, for I shifted to prints at an early stage. Still, there are some slides that go back a long time to document some early mountain trips. Many thanks to Ron for use of the scanner. I have not really pushed the capability of the scanner, so I can't comment on the quality. My slides were old and were taken with a less than ideal cameral, an old Argus C3. The age, pushing half a century, means that the slides have degraded a great deal. Generally, the slides taken with Ektachrome film are more severely compromised. However, I have been able to repair some colors in some of them with Photoshop Elements 2. Some other shots with both Kodachrome and Ektachrome are of such poor quality that they are just not worth presentation. The resulting digital shots presented below are compromised, but the memories are firmly established. This "chapter" begins with slides from California in the early 60s. These represent some really great mountain trips. Having moved to California and started a job in the SF Bay area, I was anxious to take a look at the California mountains. The road maps made it look like Sonora Pass was one of the most accessible ones. So we took off on our first weekend in the area. Well, perhaps it was the second. We then returned on the following weekend. Sonora Pass has an elevation of very close to 10,000 ft. This is a small tarn, Latopie Lake, at the base of a snowfield on the side of Levitte Peak (sp? ), an 11570 foot walk-up that we climbed on that second weekend. We camped in the bushes near the lake. View from near a high bivy on the first weekend. We climbed a couple of un-named 11,000 foot peaks on that trek. A river somewhere along the road up to the pass. Reaching the top of Levitte Peak. Looking south from the summit of Levitte. While I drove over Sonora Pass after those two trips, I never did return for more hiking. Mt. Whitney, July 4th weekend, 1961. Even though I had a little bit of climbing experience in the Northwest, I was generally unfamiliar with the Sierra. Still, I knew that Mt. Whitney was the high one, and that it had an easy route or two. One of the first things I did on a lunch break from work was to go to a local book store to purchase a copy of "A Climber's Guide to the High Sierra." Whitney was one of the first peak investigated therein. I convinced Sherm my office mate from work, to go with me for a trek up Whitney. We left work on a Friday evening, right after work, and headed south. We drove through most of the night, reaching Bakersfield, and then crossed the Sierra and drove north through the end of the Mojave Desert. We got to the trailhead, Whitney Portal, at about 6 AM. We slept for a couple of hours in the car and then headed out. Rather than camping at the usual camp spot at about 10,500 ft, we kept going to Consultation Lake at about 12,000 where we threw our bags down and collapsed. This lake was really something new to me. I had been to numerous mountain lakes in Washington, but never one at this elevation, which was much higher than most of the peaks we encountered in Washington. We got up the next morning and headed for the summit. Not far from the Lake we encountered a section of trail that has 100 switchbacks. Eventually we reached a high pass called "Trail Crest." This pass was also a trail junction. Turning north, we followed the ridge for a couple of more miles toward the summit of Whitney. If we had continued down the other side, we would have dropped into a region of monstrous mountains and lakes in Sequoia National Park. This is a view of Sherm on the summit, close to the east edge. As I recall, this is about as close to the edge as Sherm ventured. There was a rock slab that stuck out into the thin air that some of us visited. 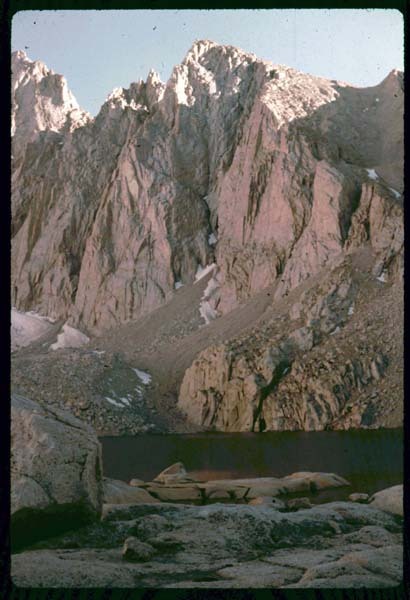 Consultation Lake can be seen from the trail approaching Whitney's summit. This a glimpse down from the trail that meandered along a narrow ridge between Trail Crest and Whitney's summit. Lakes are numerous on either side of the crest. This photo was taken along the way and shows both Mt. Whitney and Mt. Muir. We also climbed Muir on our way back from Whitney. It was just off the trail and took no more than an extra hour, being nothing more than a Class 2 scramble. I was the 73rd person to sign in on the summit register on Whitney for that weekend, and we were earlier than many folks. In contrast, I was the 3rd person to sign in on the summit of Muir for the season. The register was the original one that was put there by Norman Clyde in the 1930s, although that was probably not the first ascent. The appeal of Mt. Muir was merely that it was another peak that was over 14,000 feet. Perhaps my Colorado heritage was showing through with this motivation. I have (and had) uncles who were hooked on the mystery of the "Fourteeners." The tradition is now carried on by their sons and grandkids. The broad expanse of Mt. Whitney is seen here from a perch near the summit of Mt. Muir t 14,025. The actual summit is somewhere around this structure. Mt. Rose Area Snowshoe Trip, December 1961 - January 1962. By now I was married. Shon and I were flying to Washington for Christmas. I would then return to California while Shon would visit with her parents for a few more days. Sherm and I really wanted to go into the mountains on the long weekend of New Years, but neither of us really wanted to leave a car at a trailhead for a few days. This was a era when we normally just put water in our car cooling systems, and that was fine for the Bay Area. So neither of us had antifreeze in our cars. One of the fellows we worked with wanted to go to Reno for the holiday, but was strapped for funds. So Sherm and I made a deal with him: We would buy his gasoline and antifreeze in exchange for a ride. Jack and his wife dropped us off in Nevada half way between Lake Tahoe and Reno near Mt. Rose. Then they picked us up two days later. There was not much snow, but it was cold. We didn't carry a tent, but each had two sleeping bags. As I recall, we also had some sort of a tarp, although we never put it up. (I hope we did! I can't imagine doing anything this dumb today, especially at nearly 9000 ft elevation in the Sierra.) This was a first experience for both Sherm and me with snowshoes. It was too bad that we didn't have more snow to really test the "skins." The weather was great for our stay, often with blue sky and no sign of snow. Unfortunately, I don't have a reasonable photo of Sherm from this trip.